Don’t you hate it when you’re in the shower, ready to shave and get on with your day, and you find you’re out of shaving cream? We’ve got an easy, two-ingredient DIY solution, perfect any time! Shaving is one of those things most of us face. And when we do, we definitely want to use something that not only makes the process go smoothly, so to speak, but that is also kind to our skin after the fact. 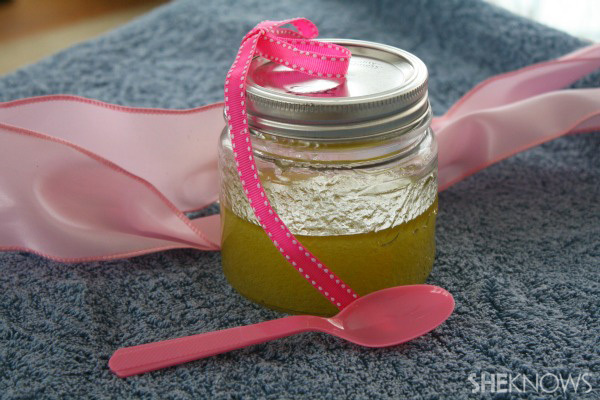 You can easily make your own shaving gel at home with just two (maybe three) ingredients! Olive oil is great in the kitchen, but it’s also wonderful as a moisturizer on your skin, too. You’ve likely used aloe vera gel on your skin after unintentionally getting a bit too much sun or on a minor skin irritation. Vitamins C and E in aloe vera are also great moisturizers for the skin. Combined, olive oil and pure aloe vera gel will set you on your way to smooth skin! 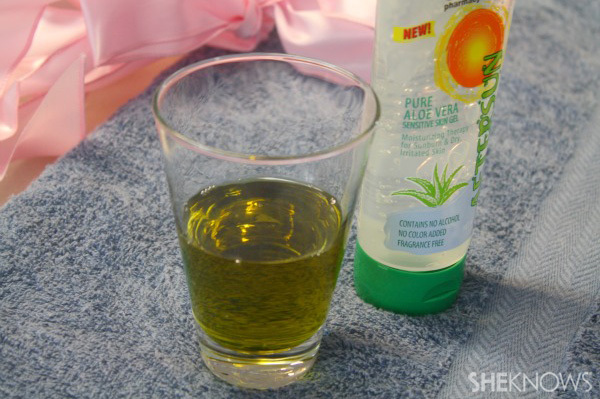 Combine one part olive oil with three parts pure aloe vera gel (for example, 1 cup olive oil, 3 cups aloe vera gel). Mix well and add several drops of your favorite essential oil for fragrance if you’d like. Mix well and store in a container. Consider storing the shaving gel in an unbreakable container, especially if you’ll keep it in your shower. A squeeze container might be a good option, so you can simply squeeze the gel out of the bottle into your hand or on your legs. If you’re not using a squeeze container, keep a plastic spoon with the shave gel to scoop it out of the container if it has a wide opening. Use in the shower or bath, and make sure your skin is damp or wet first. Stir to combine the ingredients, as they may separate slightly, or shake to mix in your unbreakable container. Apply a thin layer of the gel to the area to be shaved, and shave as normal. If you’re looking for options when you shave, Pure Silk Shave Cream is what you should reach for. Pure Silk is a line of rich and luxurious moisturizing shave creams for women. Available in a variety of spa-inspired fragrances, Pure Silk offers seven choices for shaving bliss, whether you have sensitive skin, dry skin or you’re looking for a fragrance like Kiwi Berry Bliss to help take you to the tropics — at least in your mind! Pure Silk products are made in the USA and are not tested on animals. EOS Shave Cream by Evolution of Smooth offers non-foaming shave cream in several fragrances (and a fragrance-free option, too). Made with natural shea butter and aloe — ingredients that nourish the skin — EOS Shave Cream provides 24 hours of deep moisture. Don’t forget that this cream is paraben- and phthalate-free. You’ll also love the unique packaging of the Shave Cream and other EOS products like lip balm and hand lotion. The majority of products from Whish Body are focused on the shaving prep, the act of removal itself or the after-care of shaving (there are also other products like body washes, scrubs and moisturizers). The line of products is wonderful for pampering a gal! Whish Body Shave Crave comes in four fragrances and pumps out a thick whip for a moisturizing shave. Shave Crave is made in the USA with earth-friendly packaging and ingredients — without animal testing.